Every movie featured on this blog must be evaluated on its own terms. There’s two reasons for this: first, each film is a piece of art unto itself; second, placing them in historical context demands more time (and expertise) than I can muster. Let’s leave that to the Wikipedians. My philosophy serves Silent Volume pretty well, but it’s no good this week. 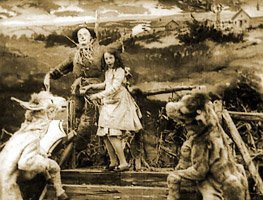 Had I seen only a tenth of the films I’ve seen, or read none of the books about film that I have poured through in my life, The Wonderful Wizard of Oz (1910) would still be impossible to consider on its own. Any film with this name (or any name ending with ‘of Oz’) fights for attention beside (or beneath?) The Wizard of Oz (1939). That film is almost primal, at least for North American children. It informs our ideas of film-making before we know what movies are. For most kids born since 1970, The Wizard of Oz will be the first film they ever see in black and white. Everybody knows its characters, its scenes and its songs. It is the most watched movie in history. Actually, the 1939 film is the fifth adaptation of L. Frank Baum’s 1900 children’s story. But it is everywhere, and one can’t help but compare other adaptations to it. It will always be Judy Garland et al, linking arms and skipping down the yellow brick road, singing songs in my head, even if I’m watching their unidentified, silent counterparts from 1910. I can’t fight my upbringing and I won’t try. So let’s begin. 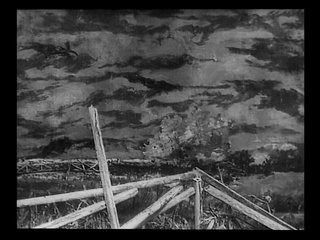 The blatant difference between the 1910 and 1939 Wizards is length, with the earlier film clocking in at only 13 minutes. Yet the story is entirely familiar. Its touchstone moments: the cyclone, Dorothy’s discovery of the Tin Man and Cowardly Lion, the Witch’s death-by-water bucket, the Wizard’s ascent-by-balloon, are all intact. These moments are the core of all Wizard of Oz stories, and their presence authenticates the tale, no matter what else is absent or added. (It’s worth remembering that the 1939 film is itself the product of truncation. Baum’s text is episodic; it contains several, self-contained adventures that, if filmed in their entirety, would push any movie well past the three-hour mark). Actually, the 1910 Wizard draws as much from a same-named 1902 stage musical as it does from the book. The musical was highly successful, toured for years, and wasn’t for kids. Films weren’t for kids either, at least in 1910; I imagine most of the movie’s audience were as familiar with the musical as they were with the book (perhaps more so, if they hadn’t any children). The shift from stage to screen cost the audience every song, but gained them other things. This was an era when films were still novelties unto themselves, and here was a chance to see how cinema’s powers of editing could transform the well-loved play into something new. Seeing an already spectacular stage production on film must have been a tantalizing prospect for director, actor and audience alike. Of course, we’re viewing it from the other direction. So what’s ‘new’ in this old silent film? For starters, you’ll find this Dorothy a lot less memorable than Judy Garland; she’s a real kid with a good soft-shoe act, but obviously, no musical numbers. Mostly, she stands toward the back of the stage and observes the weirdos around her. There’s a lot of weirdos. Dorothy’s entourage swells beyond the Scarecrow, Tin Man and Cowardly Lion to include Imogene the Cow, Eureka the giant cat, and a donkey. These new characters (along with the Lion, once he’s introduced) are portrayed by acrobats in animal suits. Toto is played by an acrobat as well, though he begins the film as a regular dog. Imogene had replaced Toto in the stage musical, because, I assume, a live dog would wreak havoc in a live show. But in the 1910 film, Toto is transformed into a giant dog by Glinda the Good Witch, so dog and cow can co-exist. The 1939 film’s opposition of drab reality to Technicolor surreality is absent here—it’s pure fantasy all the way through. Thirteen minutes isn’t enough time for such questions, anyway. The original Wizard is about spectacle, not longing, and it still delivers with every hyperactive, anarchic scene. Watch Dorothy, the Scarecrow and the farm animals cling to a haystack that spins and flies off-stage as the winds rise; see the Wizard’s throne room bustle with spearmen and dancing girls in tiny skirts; try to turn away as Dorothy and her friends attack the Witch’s lair, with its flying lizard-men and windows that look like giant eyeballs. 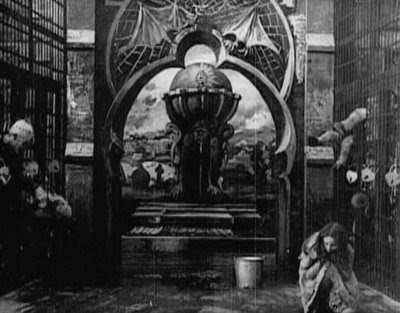 Films of this time kept the camera still and relied upon the actors and sets to provide the energy. The Wonderful Wizard of Oz gets it done, with all the lunatic zeal one could hope for. Now, this Dorothy never does make it back to Kansas. That seems okay, since she arrives in Oz with several friends and little is made of her relatives back on the farm. And really, if Kansas had a talking Scarecrow, what is Oz except a better place to party? Let’s turn our feelings of loss in a positive direction, and try to enjoy The Wonderful Wizard of Oz for what it is: a crazy short, well shot, expertly performed, in a spirit distinct from everything that came later. We’ve all got 1939; 1910 is for those of us travelling a different road. And there’s always YouTube, with my usual warning, “fixed-camera films lose all their detail on YouTube.” Press play at your own peril. I really thank to one who wrote this article. I have always been reading and writing texts like this in blogs. Thank you very much for the excellent and useful subject. Terrific posting. I'm teaching a course pairing THE WIZARD OF OZ with WICKED, and I've shown my students your post to give them an idea of the kind of language, style, and substance I'm looking for. Keep it up!